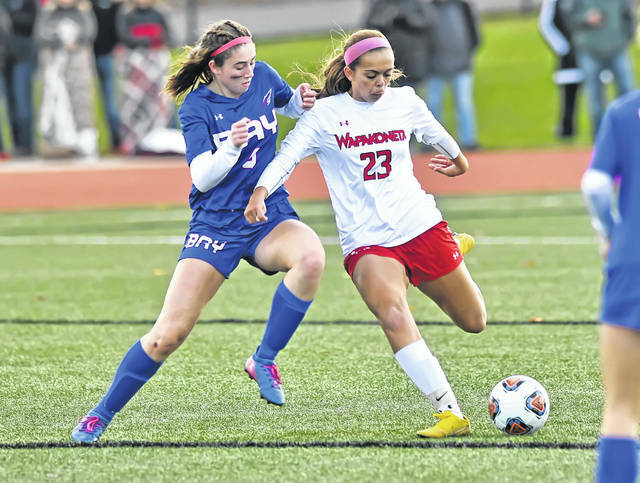 Wapakoneta’s Madi Lause, right, keeps the ball away from Bay’s Avery Alexy during Saturday’s Division II regional final at Jack Miller Stadium in Ashland. See more soccer photos at LimaScores.com. 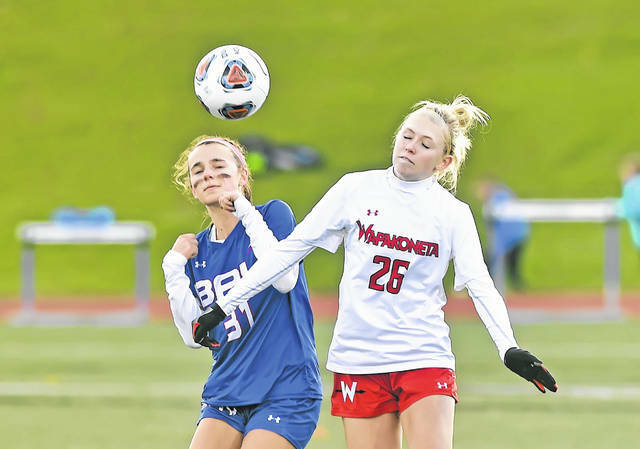 Wapakoneta’s Morgan Follin, right, and Bay’s Grace Frey compete for the ball during Saturday’s Division II regional final at Jack Miller Stadium in Ashland. Wapakoneta’s Drew Peachy has control of the ball during Saturday’s Division II regional final against Bay at Jack Miller Stadium in Ashland. Wapakoneta’s Abbigail Ruppert gets past Bay’s Haylee Duffy during Saturday’s Division II regional final at Jack Miller Stadium in Ashland. 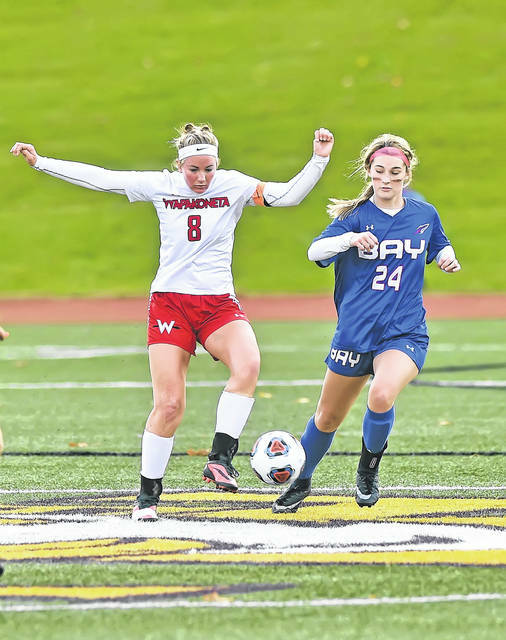 Wapakoneta’s Torie Carter and Bay’s Kealy Sullivan battle for control of the ball during Saturday’s Division II regional final at Jack Miller Stadium in Ashland. 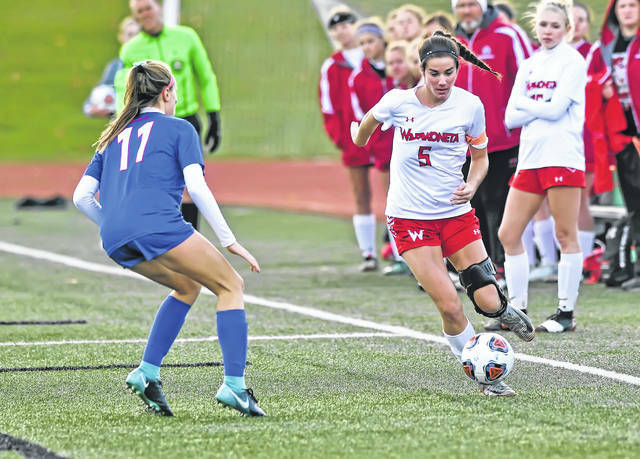 Bay Village’s Allison Sharpnack defends Wapakoneta’s Emily Ruppert dribbles during Saturday’s Division II regional final at Jack Miller Stadium in Ashland. 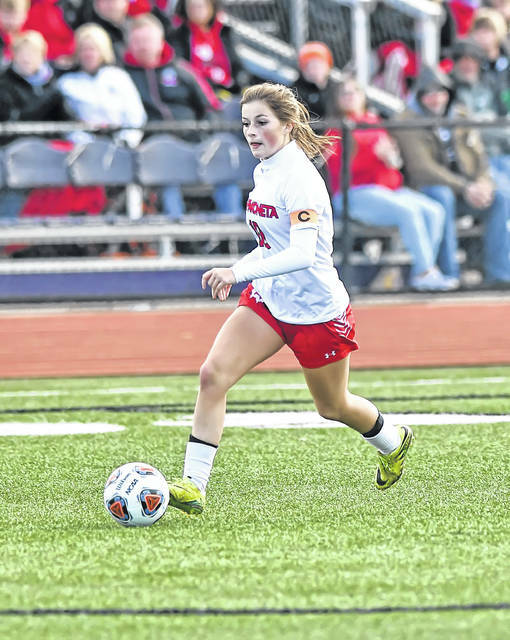 Wapakoneta’s Nicole Richard controls the ball during Saturday’s Division II regional final against Bay at Jack Miller Stadium in Ashland. ASHLAND — Bay goalkeeper Maeve Johnston has come up big for the Rockets all year. Johnson made a leaping tip save with the game on the line which helped spark Bay Village Bay to a 4-0 victory over Wapakoneta in the Division II girls soccer regional final Saturday at Ashland University. Bay (13-5-3) advances to the state semifinals against the Mentor Lake Catholic, a 2-1 winner against Richfield Revere, at 7 p.m. Tuesday at a site to be named. The Redskins end their year 12-6-2. Bay led 1-0 at the half, in which it controlled the ball about 80 percent of the half. 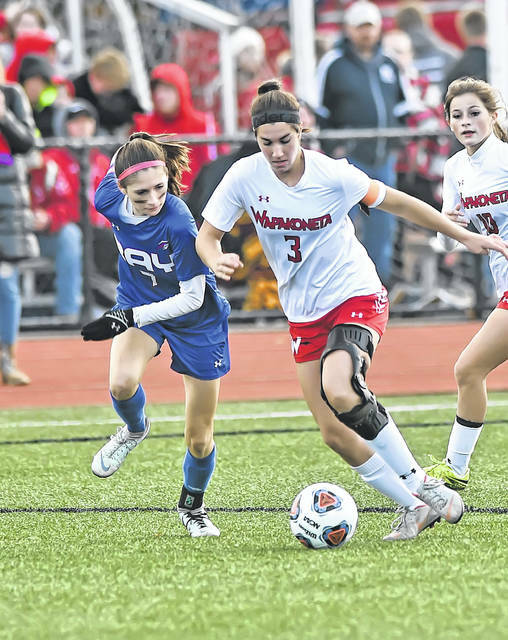 Wapak started strong in the second half with an offensive surge through the midfield. Wapakoneta forward Emily Ruppert had a breakaway two minutes into the second half. She took the ball into the box and fired a rising line-drive shot from 12-yards out, which appeared headed just under the crossbar. Johnston leaped and barely tipped it over the bar for the save the game. That leaping save kept Bay with a 1-0 lead with 38 minutes to play. Then with 32:25 to play, Wapakoneta goalkeeper Corrine Raney came out of the goalbox to stop Bay’s Abby Shuster at the left post. Shuster slide the ball to Abby Smith, who pounded the ball into the open right side of the net. That gave Bay a 2-0 lead. Bay extended its lead to 3-0 when Madison Wall hit a laser shot into the net from the top of the arc, 22-yards out. That came with 19:59 to go. Bay closed out the scoring with an own goal with 13:27 to go. Olivia Reed played the ball into the goalbox and the ball ricocheted off a Wapak defender and into the net to make it 4-0. Raney came up with 10 saves, with very few of the easy variety. Johnston made four saves for Bay. Both teams had four corner kicks. Bay controlled the midfield most of the match. Bay’s quick steals and precision-passing game was too much for the Redskins. Bay took a 1-0 lead with 38:54 left in the first half when Reed passed inside the 18-yard box to Avery Alexy, who chipped it home from 7-yards out. Then, there was the Bay defense. Bay defender Haylee Duffy smothered Wapak forward Abigail Ruppert and followed her every step of the match. Bay also rotated defenders on Wapak’s Emily Ruppert and Morgan Follin. 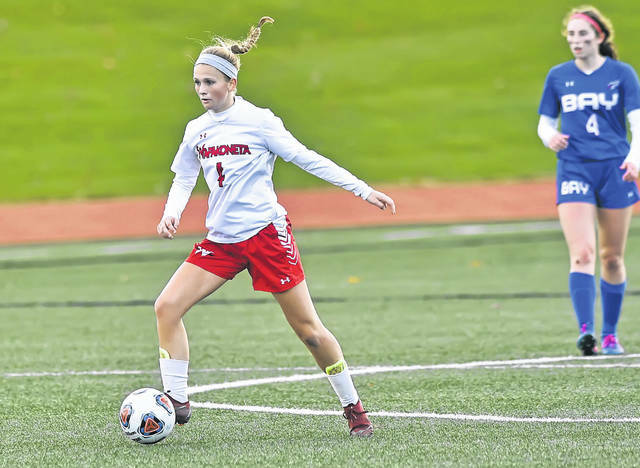 It was Wapakoneta’s first trip to the girls soccer regional finals after it lost in the regional semifinals last year. This entry was tagged Wapakoneta. Bookmark the permalink.